Five years after Waters' worst album, Radio K.A.O.S., he surprises us all with what may well be the best album of his solo career. I'd go as far as saying that Amused to Death is even much better than The Wall and The Final Cut. It's musically interesting, the underlying concept isn't filled with mindless wandering and countless characters and is such that most intelligent human beings will get the point. I'm not sure if this is what Waters had been striving all along for, or just his past experiences guided him to this wonderful gem. Amused to Death was inspired by the book "Amusing Ourselves to Death" by Neil Postman, basically a critique of mass media culture and television. You can hear this inspiration from all of the sound effects of television programs playing in the background between songs. This theme is used effectively throughout the album causing the individual songs to take on the feel of being "television programs." Between many of the songs one can hear the sound of channels on a television being changed, thus implying each song being a "program on another channel." This tie-in is just plain genius on Waters part and he pulls it off quite nicely. 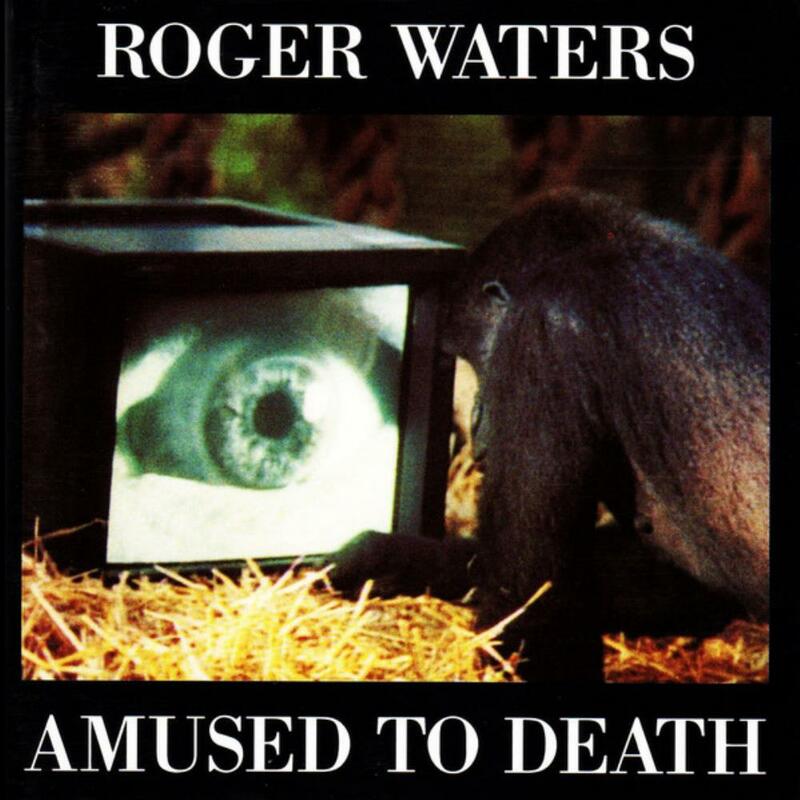 Furthermore, Waters briefly throws in a theme within the overall theme, basically using animals as human counterpart analogies (on the What God Wants trilogy), very similar though not as overarching as the Animals album. You may get the initial feeling that the subject matter jumps around a bit, basically various subjects that explore Waters' disillusionment with modern human civilization. But when you consider the context, a perfect analogy would be the different news stories on a CNN program, or like mentioned before, the flipping of channels. Waters really thought this one out and like most thought-out arrangements, the listener often discovers something new with each listen. I just love albums that feature this quality. For the musical aspect of this album, Waters brought on a long list of guests and session musicians, including the likes of Jeff Beck (who provided some really stunning guitar work), Andy Fairweather-Low, Rita Coolidge, P.P. Arnold, Jeff Porcaro, bassist Randy Jackson (the American Idol judge! ), among others. For the most part, this album leans more towards AOR, but with a healthy dose of progressive leanings. Many of these songs could have been AOR radio station hits. Though not like the prog rock from the 1970s Pink Floyd, it's a vast improvement over the countless whispering vocals over minimalistic pieces of music he had done on previous albums dating back to The Wall. There are places where Waters' vocals sound strained, but for some reason (at least to me), the strained style fits him and the music nicely. The album does have many dark moments, but how could it not with this type of subject matter: war, misuse of God's name, money, power, etc. Overall, almost a masterpiece, but indeed an excellent album. Definitely worth four stars (perhaps 4.3 would be better). Recommended to Waters fans, Pink Floyd fans, and those interested in high quality conceptual works.